A check amongst members would reveal a wide variety of birding holiday destinations over the recent past: Ecuador, Galapagos Islands, Spitzbergen, India, Bulgaria, Cyprus, The Falkland Islands, New Zealand and Spain are some I recall people visiting over the past few years. Despite this most birders spend their time locally and, especially in the UK, everyone has a "Local Patch" where much time and effort is put into recording the species seen in their chosen area. Of course along with this simple listing comes an in-depth knowledge of their "patch", not just the avifauna, but also the associated trees, insects and flowers that combine to produce an integrated, localised eco-system. This enhanced perception and sensitivity to relatively small areas is put to good use when carrying out survey work initiated locally by the county society or on a larger scale as part of national surveys. It's at this time that members can be regarded as Ornithologists rather than just Bird Watchers ! Tatton Park was left to the National Trust when the last of the Egerton family, Maurice, died in the 1960's, it is now run on their behalf by the Cheshire East Council. 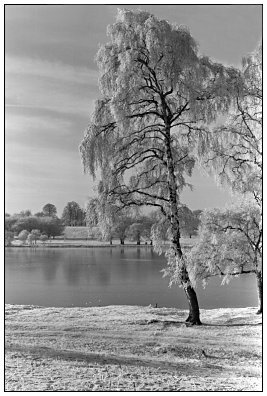 Covering over 1000 acres, most of which is open to the public, the most important feature of the park is the Mere or lake stretching from one end of the Park towards Tatton Hall for about three quarters of a mile. At the south end of the Mere is a large area of phragmites reed (Knutsford Moor), that reaches almost to the centre of the Town this has provided many excellent records over the years. Elsewhere scattered clumps of trees break up the rolling parkland and, mainly around the perimeter, are substantial areas of predominantly oak woodland. During survey work for The Breeding Bird Atlas of Cheshire and Wirral an area of 4sq. kilometers including the Moor was found to contain 80 breeding species, a high number in this part of the World ! Currently the all-time Tatton list stands at over 200 species, quite substantial for inland Cheshire; 3 regulars have personal totals in the 150's, so there is a certain amount of friendly rivalry ! It's my intention to update this website on a regular basis so visitors can enjoy with us the comings and goings over the year.